How can our multifaith society respond to increasing religious and political extremism? 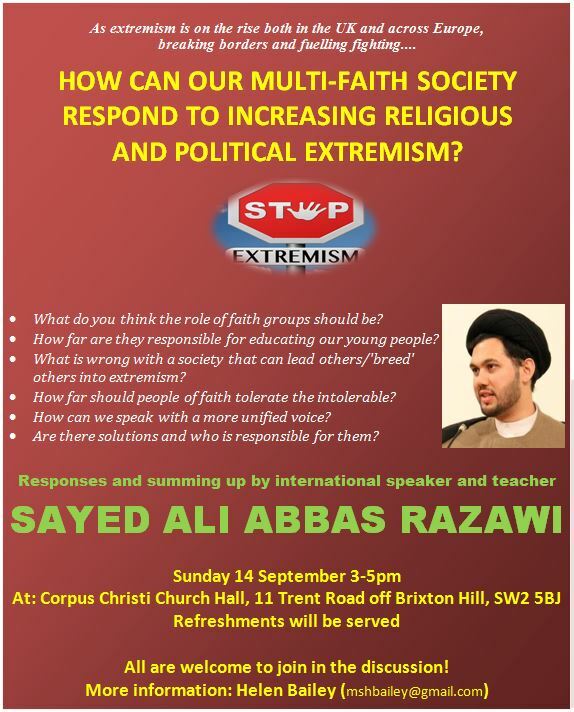 A talk by Sayed Ali Abbas Razawi on Sunday 14 September 3-5pm at Corpus Christi Church Hall, Trent Road, Brixton, SW2 5BJ. Mainly for Islington people (but ask Roz Miller if you are interested in attending from another borough), Islington Faiths Forum is holding a conference with Islington Council and Police – Making Islington Safer Together on Wednesday 17 September 10am – 3.30pm in the Council Chamber, Islington Town Hall. Download the flyer here. Not in London, but featuring several friends of LBFN, the Inter Faith Network for the UK‘s National Meeting in Birmingham on Monday 29 September 10.15am – 3pm. Speakers include Acharya Modgala Duguid of Islington Faiths Forum, Angharad Thain of St Ethelburga’s, Jon Dal Din of Westminster Interfaith, Revd Daniel Otieno Ndale of Hillingdon Inter Faith Network and Phil Rosenberg of the Board of Deputies of British Jews and formerly of Faiths Forum for London. The National Meeting is open to everyone** open to member organisations – download the programme here and the registration form here. The theme this year is “Tough to talk?”. The Christian Muslim Forum is holding Lunchtime Dialogues at St Joseph’s Hospice, Mare Street, Hackney, E8 4SA at 12-1.30pm on 2 October. On 25 October 10am – 4pm, there is an Interfaith Community Event at Trinity at Bowes Methodist Centre in partnership with Oakthorpe Turkish School, Palmerston Road, Enfield, N22 8RA. Download the flyer here. And don’t forget our own Peace-Building in the 21st Century on Monday 15 September at St Ethelburga’s and the next LBFN meeting on 23 September in Camden, looking at how our local work is supported and funded. ** Thanks to Bessie White for correction below – only open to members of IFN UK, so if your faith forum isn’t yet a member, consider applying this year! This entry was posted in Camden, Corporation of London, Enfield, Hackney, Hillingdon, Islington, Lambeth, Westminster by Catriona Robertson. Bookmark the permalink. Iâm afraid itâs not right to say that the IFN national meeting is open to all. Itâs open for members of member bodies of IFN, more than the AGM which is for official representatives of member bodies, but limited all the same. Itâs not open to members of the public or even aspiring members of IFNâ¦â¦..
Should be an interesting meeting though.